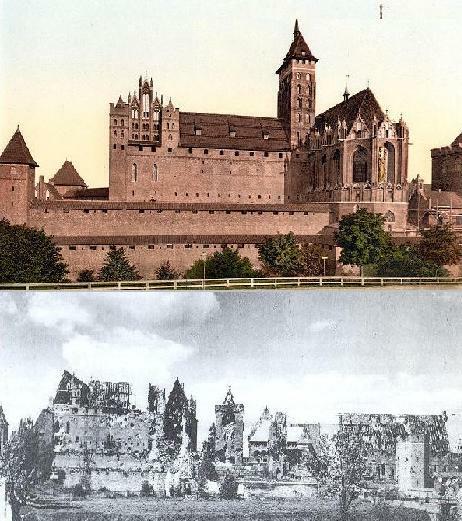 The Marienburg castle was founded in 1274 by the Teutonic Order and named after their patron saint, the Virgin Mary. The Order under Siegfried von Feuchtwangen moved its headquarters into Marienburg in the Vistula Delta, which gave them access to the Baltic Sea. The castle, once housing 3,000 “brothers in arms,” was expanded to become the largest fortified Gothic building in Europe. It consisted of 52 acres with three separate entities, the High, Middle and Lower Castles, separated by multiple dry moats and towers and all within the outermost castle walls. The Teutonic Knights collected river tolls on passing ships and had a monopoly on the trade of amber. The city became a member of the Hanseatic League and many Hanse meetings took place at the castle. The castle had a tumultuous history and by the early 1800’s, having been reconstructed and repaired, it became a symbol of German cultural history and national consciousness. At the conclusion of World War II, more than half of the castle was in ruins from Allied bombing and, together with the surrounding city, it was given away to Poland. In October, 2009, some human bones were found in by workers digging foundations for a five-star hotel by the castle, which is now a partially rebuilt Polish tourist attraction and a UNESCO “World Heritage” site. Six months later, the bones totalled those of some 2,120 men, women and children, including babies, all with no clothing, no documents or personal belongings, except for a pair of child’s eyeglasses. It is assuredly the site of the mass murder of some of the 3,000 unaccounted for people who could not flee Marienburg in time as the advancing Red Army closed in on them in early 1945. There was evidence of crushed and broken bones and the skulls found at the top of the heap had bullet holes. Lime had been used to decompose the remains.